You are here: Home / News / The baseball/football career decision is Kyler Murray’s alone. The baseball/football career decision is Kyler Murray’s alone. (ThyBlackMan.com) The Oklahoma Sooners have added one of the more intriguing graduate transfer quarterbacks in recent yards by adding former Alabama quarterback Jalen Hurts. Despite racking up wins for Alabama for three years, the emergence of Tua Tagovailoa led to Hurts seeking a starting quarterback position elsewhere. Hurts’ decision to transfer to Oklahoma had to be difficult one but it had to be an easier decision than the decision for man Hurts will replace at Oklahoma, Kyler Murray. Murray, the 2018 Heisman Trophy winner, has recently declared for the 2019 NFL Draft but his decision to enter the NFL Draft is unlike many that the NFL has ever seen because of Murray’s unusual circumstances. When college underclassmen announce their intentions to enter the NFL Draft, they have every intention and hope that they will play in the NFL the year that they are drafted. Kyler Murray is a completely different situation. He is the epitome of a two-sport athlete. After being drafted by the Oakland A’s of Major League Baseball ninth overall during the 2018 MLB Draft, he signed professional baseball contract that included a $4.66 million signing bonus. Murray was happy in the moment saying that being a professional baseball player was, “A little surreal, obviously, getting to play a professional sport, whichever one it was, but it’s been a great day, and I’m just thankful and blessed”. Oakland saw enough of his potential to take him high in the MLB Draft in June of 2018 and also allowed him to play college football with Oklahoma in Fall 2018. The decision may end up backfiring on the Oakland A’s as Murray had a Heisman Trophy winning year and possibly cemented his enjoyment for playing the game of football over baseball. 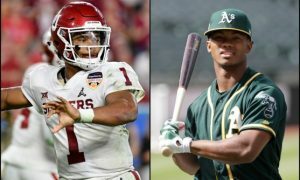 The declaration of entering the 2019 NFL Draft does not mean that Kyler Murray has made a decision to play professional football over playing for the Oakland A’s minor league team in 2019. That is likely a key point in Murray’s decision of whether he will play in the NFL over staying with baseball. The road to actually playing in Major League Baseball can be very long and not even guaranteed for first round picks like Murray. This is in sharp contrast to the NFL, where if Murray is a first round pick as a quarterback, he would likely have the opportunity to compete and play right away in the NFL. But there is an important point that has to made regarding Kyler Murray and that fans, the media, and even his family should allow Murray to make his football and baseball decision himself. It is not unusual for adults to refer to college students as college “kids”. This includes adults giving advice to college athletes like some college basketball underclassmen who decide to leave for the NBA Draft and pursue their dreams. It is easy to tell other people what to do with their lives because those giving the advice aren’t invested in the person they are giving advice to. This is the case with Kyler Murray as several members of the sports media have suggested that Murray should pick professional football or professional baseball. Because he is arguably the first athlete since Bo Jackson to be a first round draft pick in NFL and Major League Baseball, Murray does have some leverage that he can make an educated decision after a lot of thought. His decision between football and baseball is the most important decision of his young life and he doesn’t need any negative feedback as a young man.